I’m back with some interesting stuff to tell you this week. First of all… I received my semester 1 results. I was quite pleased with myself unlike pretty much some of my friends. Well… my opinion about coming to study in the UK is that, if you know how to balance work and fun, you will have the time of your life. Another interesting event going on campus currently is the Surrey Decides Election. It is basically an opportunity for every student to express their opinion by casting votes for their favorite candidate. These elections take place to elect the members of the students union for the forthcoming year! The Students’ Union is headed by 5 officers and they are the Union President, Vice President Voice (VP Voice), Vice President Support (VP Support), Vice President Activity (VP Activity) and Vice President Community (VP Community). Lots of campaigning happened last week and it was fun to watch the creative, innovative and funny ways the candidates showcased themselves. You may ask… how do I vote for a person I don’t know? How am I supposed to know about their objectives and goals? The answer to that is question time! Question time is an event organised, again, by the student’s union, where the candidates are literally bombarded with questions coming from the audience. One can get to know them and what they will do if they are elected for their chosen role. Yet another amazing event in the same week– Meet and Greet for our Indian Feb starters…and the credits for organizing the event goes to our International officer for India… Sharath Meppalil. Some of you may have met him during international university fairs. 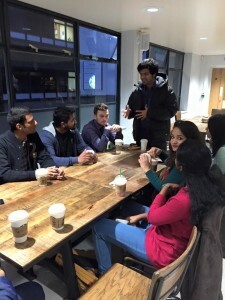 The objective of the event was to give a warm welcome to our new Indian students and also give them an opportunity to meet the student ambassadors (me and Charan) and some of the current students here at Surrey! We were asked to come to Starbucks at 5:30PM and found out that we were a diverse group from different parts of India. After a cuppa and quick intro by Sharath, we were starting to warm up to each other and talked about the experience so far at surrey. 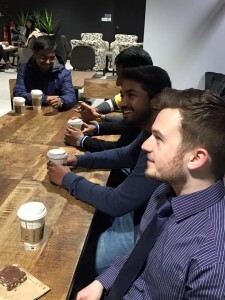 It was a good opportunity for the new students to mingle and find out more about the university, although I was quite surprised to find out that they already knew each other! 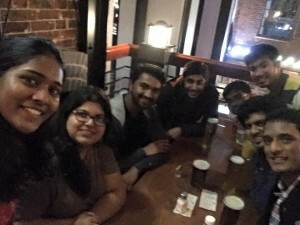 After figuring out what a fun bunch we are, we decided to go to weather spoons (restaurant-bar) in the Guildford town center. Collectively, it was a fun outing for all of us and a chance to get to know new people from the same background, which will make any person feel right at home (or) a home away from home! There are so many things happening in a week that will make you excitedly look forward to the next one. Along with lectures and course work, there are so many different things that will make your surrey experience one of the best periods in life!